Is the smooth pair of curves the stock run? I notice that the torque & HP on that run are higher at the top end. Nope that was my buddy mike's full boogie CBSS supercharged we were comparing them & I forgot to remove that run. Rick I assume the lower TQ curve is the BW wheel upgrade, it appears we are still falling at 5300 ish. indeed, no matter what turbo is aboard. I have a theory as to why, I believe it's mainly due to mixture prep from injection during the compression stroke. Stock vs SOLO Race exhaust system. If I get the GM Stage II I'll go get it done again. That is odd... Doesn't SOLO say on their website their Race / Street-Race kit is good for 27 HP? This is no where near that amount, even in flywheel sense (unless my math is wrong). The 27 HP is max HP gain, not peak HP gain. My peak gain was 20 HP flywheel which is about what they got as well. Of peak I gained 25 HP to the wheels after the top. However by now most of that gain has been learned back down. 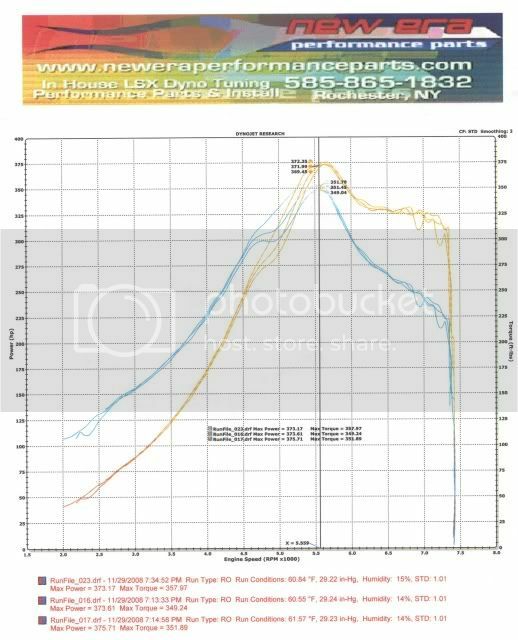 I have the Solo SR exhaust and am wondering if there will be any power increase over the GM Stage 2. I'm pretty sure the increase will actually be larger than by itself. I can feel the turbo spool time is faster with the SOLO Race or Street/Race exhaust even with the learn back down over time. The biggest gains from the exhaust also come when the turbo is nearest the limit and since the Stage II kit puts the turbo closer to the limit all the time we should see a larger gain in more areas. If I get the Stage II I'll have it dynod with the SOLO exhaust for sure. I have a theory as to why, I believe it's mainly due to mixture prep from injection during the combustion stroke. Injection during the combustion stroke???? Dieseling are we??? I guess I need to look into the homogenous combustion cycle. lol, fixed it. Supposed to say compression stroke.